Termotec owns the latest technology machinery, with horizontal and vertical clamping devices. 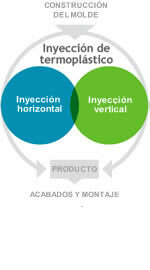 Termotec provides thermoplastic injection as its principal activity, thanks to its cutting edge machinery. The company also offers mold construction starting from a injection part plan, as well as services such as assembly or painting. The thermoplastic injection process allows a great versatility of products.